In a joyous celebration in Seattle on Tuesday, December 12, Marie-Thérèse Gnamazo of Cameroon officially became Sister Marie-Thérèse, SP. The Sisters of Providence who first met her when she came to Seattle for a Come and See experience in 2008-09 were thrilled to welcome her into Mother Joseph Province. Marie-Thérèse had returned to Cameroon as a Providence Associate inspired by the spirit of the religious community’s foundress, Blessed Emilie Gamelin of Montreal, and the community’s charism to serve those who are poor. In the ensuing six years, Marie-Thérèse has truly made a mark in the rural village of Lomié, including founding an organization in Seattle called African Solidarity in Action, which built a well for the residents, providing one of life’s most precious gifts: clean water. 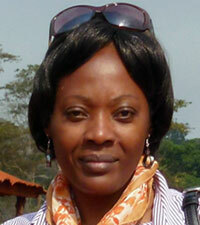 “Water is important, especially for the children who become sick from unclean water,” she explained. Providence General Superior Karin Dufault, surrounded by singing and dancing children, tried her hand at pumping the well when she visited Cameroon in 2013. Support for the wells, now three of them, led to tuition support for students in nearby schools (at least 33 students now) and to construction of a small clinic. Donations came from Sisters of Providence, Providence Associates and from friends in Europe, including Rome, where Marie-Thérèse had worked as a secretary. At the reception, Sister Marie-Thérèse led a spirited conga-style dance line. Marie-Thérèse said her ministry in her native country was a good and satisfying one, and she was living the sisters’ charism, “but God was asking me to do more, to give my life as a consecrated religious with the sisters.” After prayer and discernment, she wrote a letter to the Sisters of Providence asking if she could return. She became a candidate on May 19 of this year and has been living in community with the sisters, spending time in prayer and reflection on sacred Scripture, attending gatherings and participating in some of their ministries. “This is a night of joy for us,” said Sister Beverly Dunn, who has been candidate director for Marie-Thérèse. The novitiate entrance ritual at St. Joseph Residence was presided over by Provincial Superior Judith Desmarais, who gave Marie-Thérèse the community pin and a copy of its Constitutions. The ritual and the reception that followed underscored the international, intercultural and intergenerational nature of the Sisters of Providence. Before theceremony got underway, Sister Marie-Thérèse taught guests in the audience, including members of her parish community at Our Lady of Guadalupe, to sing a song in one of Cameroon’s dialects. Three Ugandan sisters from the Daughters of Mary, who have a decades-long relationship with the Providence sisters, provided accompaniment on the drums. 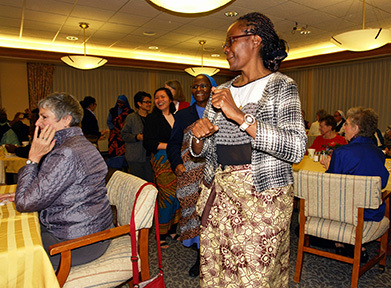 And at the reception after the novitiate entrance ceremony, Sister Marie-Thérèse led a spirited conga-style dance line of sisters and associates of all ages and nationalities, and friends from Cameroon. Sister Marie-Thérèse now begins her canonical year as a novice. A couple of days after entering the novitiate, she headed to Edmonton, Alberta, for the Bi-Province Novitiate with Holy Angels Province where she joined another novice, Rezebeth Noceja. Sister Celia Chappell of Mother Joseph Province is the novitiate director. Because of visa regulations, Sister Marie-Thérèse’s stay in Canada will have two parts to it during the year, and she also will spend some of the time back in the United States.